Today Apple released the latest version of its operating system, dubbed OS X “Mountain Lion,” which includes a more robust messaging capability, integrated dictation, expanded integration of social apps like Facebook and Twitter, and over 200 other new features. This release could be characterized as a more minor upgrade than that from “Leopard” to “Snow Leopard,” but still bears mentioning, particularly for all you Mac fan boys and girls. Though this may seem pedestrian enough, as a Dragon Dictation user, I’ll look forward to giving this new integrated voice capability a test drive (and it’s certainly a deal, considering the $19.99 price tag for the upgrade, compared to the $100+ cost of full dictation products like Dragon Dictate). Other notable features are the new and more integrated social applications supporting Facebook and Twitter. Now, you simply sign in once and your Mac can share to Facebook. Notification Center and Contacts also are now fully integrated. 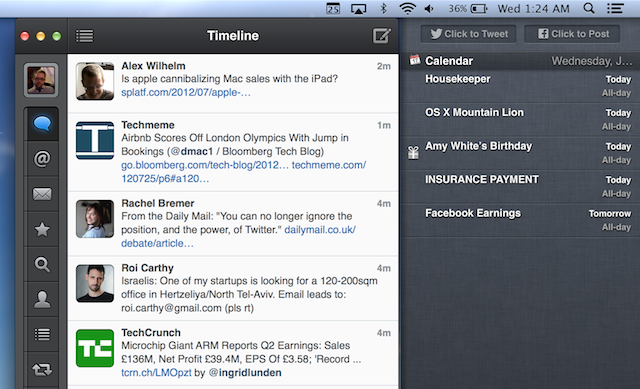 Mountain Lion has similar capabilities for Twitter, allowing you to Tweet from key Apple apps (Safari, Preview, Finder, Photo Booth, Quick Look), and to more easily share links and photos from iPhoto. Also notable, the new “Messages,” which allows you to send messages to anyone who has an iPhone, iPad, or iPod using iOS5 or later (or another Mac running Mountain Lion). This will also allow you to send iMessages to a phone number or email address associated with an Apple ID. MG Siegler with TechCrunch has been previewing Mountain Lion for several months and blogs that “notifications are the most in-your-face and probably best new feature of Mountain Lion,” explaining that we’re used to dozens of apps alerting us to things. The Messaging app streamlines those messages into a more unified stream. The details: Mountain Lion is available here in the Mac App Store, and for the princely sum of $19.99, you’ll be able to upgrade ALL your machines to ML. Me, I’ll suffer the delayed gratification of waiting for the bugs to get cleaned up before I throw down my Mastercard. In the last keynote session before Profitero was announced as the “IBM Entrepreneur of the Year,” Garage.com founder, VC, former Machead, and all around tech cheerleader Guy Kawasaki paid a visit to speak to the gathered IBM SmartCamp finalists. In classic Guy Kawasaki fashion, the renowned tech thought leader, former Apple employee twice-over, and celebrated speaker completely overhauls his presentation to the IBM SmartCamp finals just moments before he went onstage. The audience was certainly NOT disappointed in the change of topic. Kawasaki started his pitch by joking that he’d just been in the greenroom where the judges for the competition were gathered, and that there were five bottles of wine in there, so don’t expect a verdict anytime soon! Then, he got semi-serious and explained he’d worked from Apple on two different occasions, 1983-1987 and again in 1995-1997, so he was uniquely positioned to comment on what all he learned from Jobs. Then, on to the lessons. Number one. “Experts” are clueless. As entrepreneurs, if you start listening to all the experts, you will be led wrong. Time and time again people told Steve Jobs nobody would buy an (insert Apple product here)…At one point, even Michael Dell told Apple they should dissolve the company and give the money back to shareholders. Ignore the experts. Correlation and causation are not necessarily the same thing. Ice 1.0 was when ice harvesters sawed blocks of ice out of the lake when it was frozen and then distributed it. Ice 2.0 saw the advent of the ice factory, so you could get ice any time of the year, and didn’t have to be in a “cold” city. Ice 3.0 saw the advent of the “ice box,” better known as the refrigerator. The ice harvesters did NOT embrace the ice factory, and the ice factories did NOT embrace the refrigerator. Yet, all served the same purpose: Keeping your food fresh. So, if you want to be successful, put your solution to the problem in terms of the benefits, NOT the process you use to get there. Number Four. The biggest challenges beget the best work. Ram a big challenge down the throat of your employees. The challenge Steve Jobs gave us was to compete with IBM. Remember the print ad we ran. It’s headline was” “Welcome, IBM. Seriously.” IBM was a magnificent competitor, and it was a great challenge for us to take them on. So, find a mighty opposite for yourself. Number Five. Design counts. Don’t think it’s all about price. Most people also care about design, and Apple’s premium pricing has proven that over and over again. Number Six. Use big graphics and big fonts. Consider this slide when Jobs introduced the Windows version of iTunes. It had a massive Windows logo, then underneath the following headline: “The best Windows app ever written. Number Seven. Changing your mind is a sign of intelligence, not a sign of stupidity or lack of conviction. When things change, you have to react and reform. Steve Jobs demonstrated this when he evolved from accepting no independent applications for the iPhone one year, to fully embracing them the next. He saw which way the wind was about to blow, and he realized to bolster the iPhone app ecosystem, he needed to open it up to outside developers. Number Eight. Value is NOT equal to price. Nobody ever bought an Apple piece of equipment because it was the cheapest thing. Number Nine. A players hire A+ players. You should always be hiring someone as good or better than you in your own field. Number Ten. Real CEOs can demo. They can run the product, show the product, build stuff with the product. They don’t hand it over to someone else. They DO the demo. Number Eleven. Real entrepreneurs ship. Don’t worry, be crappy. Imagine you were the first refrigerator company. The first fridge had to be better than the best ice factory, but it didn’t have to be perfect. Once you jump curves, that’s when the real excitement begins. When you ship, you’ll learn more in two weeks from your customers than you will sitting in a dark room. Number Twelve. Marketing equals unique value. Pets.Com was a classic example where that rule did NOT apply. You have a dog. You have a cow. You kill the cow, put it in the can, and give it to the dog. That was the Pets.com business model. Shipping dog food. The problem was, it’s dead cows in cans. It weighed a lot. It was less convenient and just as expensive to order it via the Internet. It wasn’t unique. It wasn’t valuable. And finally, number thirteen. (Never mind Guy said there would only be twelve). Some things need to be believed to be seen. But sometimes you also need to believe in things before you will see them. Though there may have been an earthquake in Chicago yesterday, to complement the lovely snow storm, none of that had anything to do with the earth-shattering announcement today from our friends at Lotus. As the headline says, I’m a Mac, and I’m a Lotus. Lotus and Mac, it turns out, are great friends. I love it when we can all just get along. In this case, it’s all about IBM announcing that Lotus will be delivering its business-grade collaboration and social software for use on the Mac platform, including iPhones, iPod Touches, or Mac computers. In fact, I recently test drove some of this software, and was most pleased to be able to chat securely with mi IBM amigos using the Lotus Sametime iPod application. It was tres cool. With this new announcement, organizations will be able to use IBM software for enterprise social networking; instant messaging; and securely encrypted email and collaborative applications with the iPhone and Mac. The new software includes Lotus Symphony 3.0, IBM’s office productivity suite, which is now available on the Mac, providing spreadsheets, presentations and documents free of charge. In addition, new offerings for the iPhone and Mac include Lotus Connections and Lotus Sametime, which customers can use to build professional networks with social capabilities such as blogs, wikis, activities and microblogging, as well as instant messaging capabilities. Viewing a document from Lotus Quickr on an Apple iPhone. This news underscores IBM’s commitment to expanding its software to support the increasing global mobile work force and popular consumer devices. Today, IBM delivers the broadest range of business-class software for mobile devices, ranging from e-commerce, email and now social software. General Motors, for example, relies on IBM collaboration software to increase the agility of its work force through a wide range of mobile devices, including the iPhone. Analysts estimate that mobile devices will exceed personal computers by 2013 with global shipments of mobile devices growing 46 percent to more than 250 million in 2010. IBM’s Lotus Social Software can help users share and discover expertise and content instantly, harnessing the wisdom of the crowds. You can learn more about Lotus and Mac in this press release. Wow, tomorrow is gonna be some Wednesday. First, the World Economic Forum kicks off in Davos, Switzerland. Once again this year, my tickets seem to have gotten lost in the mail. Second, President Obama is slated to make his first State of the Union speech before Congress and the American people. But we all know what the really big story is for this particular Wednesday: Steve Jobs’ introduction of the new Apple Tablet computer tablet thingamajiggy that I don’t think Apple has ever even confirmed existed, much less what its feature/functions are. Once again, the brilliance of the no talky Apple marketing machine speaks volumes without ever even so much as a head nod. Me, I don’t need another Apple device. But, I’ll likely end up buying one, anyway. Can I go ahead and pre-order one now? That means all the rest of you have to go out and buy one first so that you send their stock into the stratosphere so that I can make enough to buy one for myself. Now, I don’t own many shares, so that means you all really need to go out and buy two tablets just to give me a safe margin. Of course, with Apple’s quarterly earnings announced yesterday against a record sale of Macs in a single quarter, we’re well on our way. I just pray the new tablet isn’t the second coming of the Newton.